A mysterious sea creature washed ashore in St. Simons Island and it has beachgoers scratching their heads. Jeff Warren and his son were at Wolf Island National Wildlife Refuge just north of St. Simons Island in Georgia Friday when they came upon the creature on a barrier island. Warren thought it was a dead seal, but said when he got a closer look it resembled more of the Loch Ness monster. 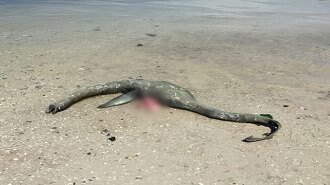 Warren sent the photo to News4Jax and said the creature was about 4 to 5 feet long with two fins, though only one can be seen in the picture. The creature has little teeth about one-eighth of an inch long. Is this creature a sea monster or just an oddly-shaped fish? For now, it remains a mystery. COULD THE MYSTERY BE SOLVED? 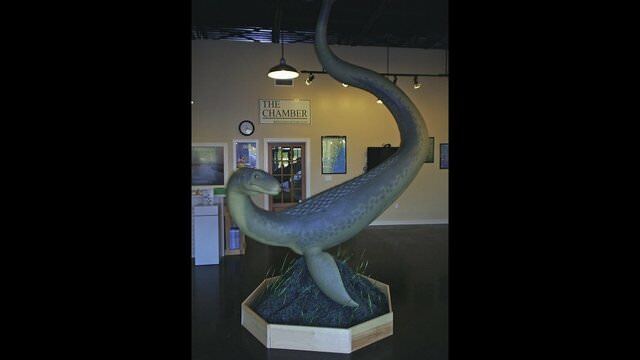 A local writer and novelist contacted News4Jax saying he believes the mysterious sea creature looks exactly like the legendary Altamaha-ha, a river monster of the Altamaha River located just west of Wolf Island. Taylor Brown, author of "The River of Kings," says he grew up on St. Simons Island and heard stories about the sea creature, known as a survivor of the Mesozoic Era. Taylor adds "Altie," as it's commonly referred to as, still swims on a greening billboard near the visitor's center of Darien, Georgia, urging interstate travelers to stop for a visit. There is also a full-size replica in the visitor's center. That's weird! I wonder what the heck that was? I remember being on a beach in North Carolina once and seeing some sand actually moving. I got closer, even picked it up. It was some sort of sand slug! Weird, but cool. Kind of wanted to take the little guy home but he probably wouldn't have survived without sand.